To make our certification program as accessible as possible, this training is low-residency, utilizing online technologies to enable people throughout the world to participate and earn certification. In addition, payment plans are available. Total tuition costs for the full program vary depending on whether you select individual or group supervision sessions with Dr. Kaparo or personal sessions with her or other certified Somatic Learning practitioners. Dr. Kaparo developed the art and practice of Somatic Learning during three decades of research, clinical practice and training of health care practitioners. Based on a synthesis of psychological, somatic and meditative disciplines, Somatic Learning integrates science-based approaches with embodied mindfulness meditations that imbue all aspects of living with greater freedom and aliveness. The practice of Somatic Learning enables each of us to awaken to the present, embodying spaciousness in a way that heals and transforms. Rather than attempting to avoid pain, compensating for our weaknesses, or trying to accommodate some limitation or trauma, we can do the inverse; using our challenging circumstances to open us to something larger than ever imagined. Dr. Kaparo has taught Somatic Learning practices to thousands of people suffering from many ailments, enabling them to transform pain, stress and trauma, preventing or reversing the deteriorating effects that we associate with aging. In addition, engaging Somatic Intelligence also enhances joy, compassion and intimacy. This two-year, low-residency training takes place as a series of intensives coupled with group and individual supervision with Dr. Kaparo. Students will complete 120 hours of training and 200 hours of practicum for certification as a Level One Somatic Learning Facilitator. This 4-day intensive - Awakening Somatic Intelligence: The Art & Practice of Embodied Mindfulness - covers the core principles and practices of Somatic Learning. At the end of this introductory course, students interested in becoming facilitators may apply to the certification program. Subsequent intensives in the certification program present an advanced level of the work, refine the method and provide maps for effective application of the material in client situations. The curricula are taught through short talks, skill-based experiential exercises, supervised practice, demonstrations, movement and video review. • Break the misidentification with image/object bound experience and awakening non-dual awareness. • Embody mindfulness to live from a deeper awareness of your authentic nature. • Transform your relationship to gravity, aging and trauma. • Use proprioceptive feedback to potentiate your capacity for learning, self-healing and self-renewal. • Facilitate compassionate communication and creative dialogue to deepen intimacy and break inhibiting life scripts. Engage awareness, breathing, intrinsic/micro-movement and movement in space to reorganize your structure, optimize performance, and reduce strain. Integrate Somatic Learning with other modes of intelligence and into all activities. Maximize neuroplasticity along with tissue healing and regeneration. Health practitioners, including physicians, mental health practitioners, counseling students, nurses, chiropractors, acupuncturists, physical therapists, bodyworkers, etc. Coaches and Educators seeking a solid foundation for building innovative relational, facilitative and counseling skills to increase their effectiveness with clients/students. People in career transition, interested in facilitating others to transform pain, stress, trauma & aging through awakening Somatic Intelligence. You will begin your practicum with a partner(s) from the training and then expand to work with others outside the training. Risa demonstrating facilitation (self & other) using touch for embodying spaciousness. will receive level one certification, and be listed on the referral network. annual requirement of 12 Somatic Learning CECs to renew accreditation. Upon completion, Somatic Learning Certified Practitioners may apply to AIWP for a ministerial license. 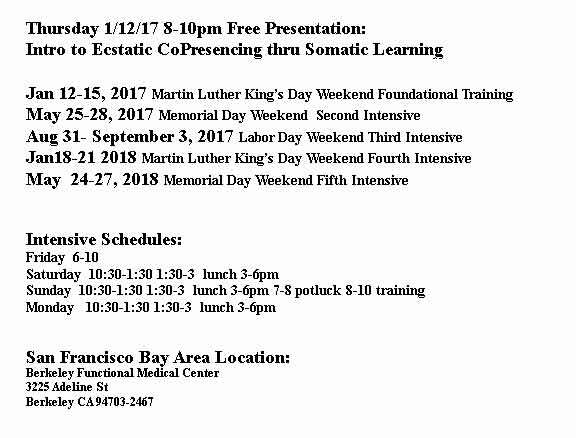 The Somatic Learning training program is sponsored by Inquiry of AIWP (Association for the Integration of the Whole Person), a non-profit corporation. AIWP was founded over thirty years ago to advance the ideal of life-long learning (we consider that the potential for human development is sacred). AIWP Credo: LOVE OF LIFE and people is achieved through an integrated awakening of physical, mental, spiritual and emotional processes. Life itself is a religious experience as realized in the temple of my being. I am performing a religious service when my thoughts and deeds involve an affirmation of life. My congregation is both myself and those who seek my support in striving towards an integration of the whole person. Upon completion of the Training, graduates are eligible for a variety of focused supplementary trainings to enhance their expertise and areas of interest. These trainings include such topics as: Yoga Teaching, Touchwork, Epistemological Profiling, Couples and Family work, Trauma work, Luscious Movement Therapy, and Advanced Supervision. "Since becoming certified in Somatic Learning, deep tidal shifts have occurred in me and all areas of my life have been enriched - my work, my relationships with myself, others, and to all that is Life. My awakened ability to sense somatically has opened up my feeling of connection to and trust in all of Life and its source - Love. As a facilitator of this work, I am beyond grateful to be able to live in service to love and the true present, where being and healing occur. My clients, friends and family often comment on my heightened sensitivity and awareness, deep presence and listening, and my ability to draw them into their own presence and elicit a profound sense of well-being." "Becoming a Certified Facilitator allowed me to take my bodily and emotional sensing to a much deeper level - into a wordless knowing. I was able to accelerate the release of chronic tension while in a safe environment of mutual growth with the other program participants. This ongoing release has profoundly affected all aspects of my life - from ease of movement and breathing to habituating a more natural posture, literally reducing pressure throughout my nervous system and brain. Having the chance to participate as both practitioner and client in a supervised situation with feedback from everyone involved was an immensely educational and unique experience. In particular, supporting ohers to experience more freedom and aliveness through facilitation was gratifying as well as insightful."